When FBI agent and witch Hazel Kinsey and her familiar Tizzy the Squirrel left the paranormal town of Paradise Falls, she swore she'd never return. She didn't want witch and Shifter politics to be a part of her adult life. Worse, she didn't want to stick around and watch her high school crush, Bear Shifter Ford Baylor, carry out the white-picket-fence dream of marriage and family with somebody else. Hazel reluctantly returns to her own personal hell only to deal with more murders, rusty witch powers, a familiar hell-bent on hooking up, and uncooperative citizens. Throw in werebear Ford, who's surprisingly single and hunkilicious, and Hazel has her hands full. Oh, my goddess! I loved this book so much. The dialogue is sassy smart, the characters unforgettable and the story a page turner. Reading the blurb it mentions a "horny squirrel" FBI witch Hazel, yep, that's what I said, has a squirrel familiar who is a riot. Hazel, a not-so-talented witch, left home right out of high school. She is a non-practicing witch and an FBI agent. When her BFF calls with bad news and in need of help, Hazel answers. She left with reasons and one of them is the gorgeous bear shifter, Ford, now a cop in town. The murder of her friend's brother becomes more murders, forcing her to work with Ford who still makes her heart pound and other body parts react as well. He adds some more news to the mayhem. The players are both shifter and witch and telling the bad guys from the good will take some strong power--can Hazel come up with what is needed? How will she deal with Ford and his news? There is some information withheld by many of the people in town. How will she handle this? There is plenty to keep you turning the pages, smiling, laughing and raising your eyebrows at the inventive labeling witch Hazel gives things and body parts. Enjoy. I sure did. Tizzy the Squirrel I can't help loving this book by Renee George. Tizzy is the best part of the story for me because she is the best familiar and up to all kinds of high jinks. In this book she got beaver-fever. You will have to read the story to find out what that all entailed. Don't get me wrong but Ford and Hazel also are good in this book but the squirrel took the cake. This is second reading of this book and I still find it entertaining. My first review of the book. Tizzy totally makes this story. 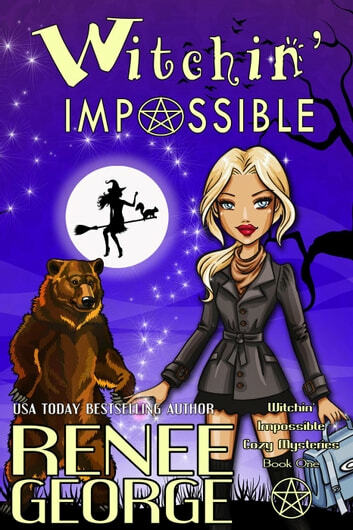 Take a bear and a witch who has failed at being a witch and throw in a squirrel who is just a little nutty and you have a story that will have you laughing even when bad things happen. 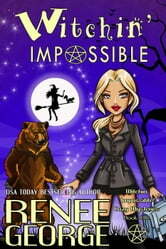 How does a failed witch become an FBI agent? Her familiar Tizzy has kept her company for the last twenty years and returns with her to Paradise Falls to help an old high school friend. Hazel will have to face her pass before she can have a future. Oh man, this book had me laughing at the antics of Tizzy the squirrel she is not your typical witch familiar and it shows. This book was worth ready just for Tizzy alone. Witch Hazel Kinsey is an FBI agent she has a familiar Tizzy that's a squirrel. Then she left home Hazel never planned to returned for a few reasons 1 was witch and shifter poiticics the 2 ND was her high school crush bear shifter Ford Baylor But her staying away all changed when her best friend called up and needs her help to solve a muder case. Oh I love the the action, drama, mystery, intrigue, characters in this . The story is fantastic. The characters are amazing. The storyline pulls you in fast and your not going to want it to end! Just awesome. Don't miss it Voluntarily reviewed a copy and I honestly loved it.